The Vatican Museum houses a vast collection of ancient objects related to the early history of the Christian church. Within that collection, on public display and remarkably intact despite its age, is an intricately carved sarcophagus—a box designed to hold human remains—that was discovered in Rome’s basilica di San Paolo fuori le Mura during its restoration in the 1800’s. Historians date it between 330 and 350 AD. 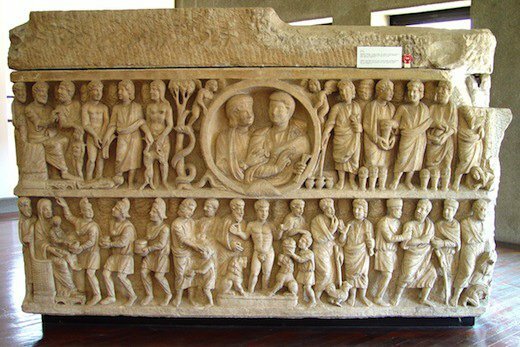 The outside of this sarcophagus is divided into an upper and lower tier and each is carved all around with biblical imagery drawn from both the Old and New Testaments. Among the scenes along the upper tier are God giving his Creation Mandate to Adam, the wedding at Cana, and the miracle of the loaves and the fish. Along the lower tier is the arrival of the Magi to worship the baby Jesus, the healing of the blind man, Jesus foretelling Peter’s denial, and Peter baptizing his jailers. In the middle of it all is an image of the Christian couple who commissioned this sarcophagus as their final resting place. In all of this the sarcophagus is unremarkable, for many similar objects have survived to this day. What sets this one apart and helps us as we attempt to see the history of the church in 25 objects is the scene carved at the top-left of the upper tier: The creation of Eve. Adam lies on the ground in a deep sleep. Eve stands beside him with the hand of God upon her head as he brings her to life. And there above her is God displayed as three identical figures. Here is a representation of Creation by Father, Son, and Holy Spirit. This sarcophagus, known as the Dogmatic Sarcophagus or Trinity Sarcophagus, is a visual representation of early Trinitarian theology. There is special historical significance in this portrayal of the three members of the Godhead involved in Creation and in the three being identical. Early in the fourth century Constantine defeated Licinius, ending a time of civil war, and uniting all of the Roman Empire under his rule. Constantine was the first of Rome’s emperors to claim Christianity as his faith and with his ascension he ended the state persecution of believers. However, with that grave external threat removed, Christianity soon faced an even greater threat from within. [T]he Father alone was really God; the Son was essentially different from his Father. He did not possess by nature or right any of the divine qualities of immortality, sovereignty, perfect wisdom, goodness and purity. He did not exist before he was begotten by the Father. The Father produced him as a creature. Yet as the creator of the rest of creation, the Son existed “apart from time before all things”. Nevertheless, he did not share in the being of God the Father and did not know him perfectly. Many Christians understood the implications of denying Jesus’ divinity and saw that it would eventually undermine his standing as the redeemer of humanity, for in order to be our Savior, Jesus had to be both God and man. Though a church council at Alexandria examined Arius’ and excommunicated him, he continued to teach and to gain influence. Soon a substantial number of Christians had been swayed and a major rift threatened to undermine the fledgling faith. Constantine saw that his empire was split over what he considered a small matter and demanded that Christian leaders convene a council to examine this issue. This, the Council of Nicea, was the first of the great Christian councils. We believe in one God, the Father Almighty, Maker of all things visible and invisible. And in one Lord Jesus Christ, the Son of God, begotten of the Father, only-begotten, that is, from the substance of the Father; God from God, Light from Light, Very God from Very God, begotten not made, of one substance with the Father, through whom all things were made, both in heaven and on earth; who for us men and for our salvation came down and was incarnate, was made man, suffered, and rose again on the third day, ascended into heaven, and is coming to judge the living and the dead; And in the Holy Spirit. And those who say: “There was a time when he was not”, and “Before he was begotten he was not”, and “He came into being from nothing”, or those who pretend that the Son of God is “Of another substance or essence” or “created” or “alterable” or “mutable”, the catholic and apostolic church places under a curse. 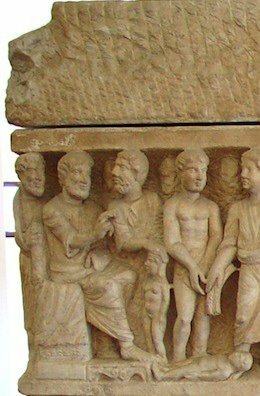 In the Dogmatic Sarcophagus we see a Nicene representation of the Trinity. The Father, Son, and Holy Spirit are identical, indicating that they are “one substance” and that they are equal in divinity even as they are three distinct persons. Had Arianism triumphed at Nicea, this box would have been carved very differently and the history of the church would have proceeded along a very different path. The Arian controversy was just one of many controversies that marked the early church and necessitated both councils and creeds. These creeds protected the church and its doctrine by their precise statements of biblical theology and by their strict warnings to those who would deviate from orthodoxy. Though the Nicene Creed was not the final word on Trinitarian theology, it remains a remarkably accurate declaration of what the Bible teaches about the Godhead. The Dogmatic Sarcophagus has survived the centuries as a visual representation of those councils and creeds, of one of the unique tasks of the early church. We may take for granted the long, hard, and prayerful labor of searching the Scriptures to determine what the Bible teaches about the relationship of Father, Son, and Holy Spirit, but this box reminds us that we owe a large debt of gratitude to our Christian forebears. It calls us to be grateful for the Lord’s work through the men who labored at those ancient councils. We build upon their legacy.